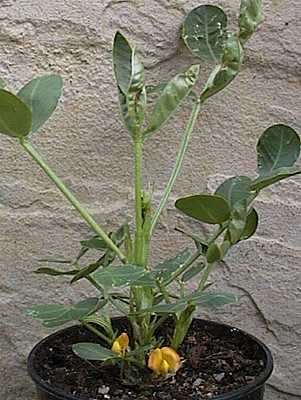 Thanks to the attentions of squirrels or mice, which collect peanuts put out for birds or hedgehogs and bury them, this came up in a pot in my greenhouse. I transplanted it into a pot of its own to see what it would do. It surprised me by flowering after just a few weeks when only 4 inches tall. 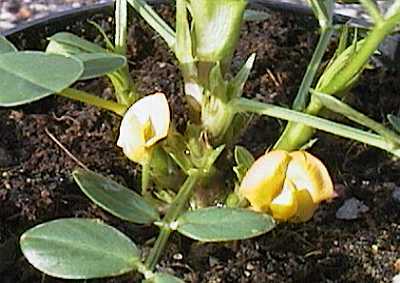 I knew that peanuts were the seeds (seed-pods if still in their shell) of a leguminous plant, which had the unusual habit of burying the pods in the ground after the flowers set seed, and I wondered how this happened. These two flowers appeared right at the base of the plant. If the flowers are always there, then I can see how it might be a bit easier to get the pods into the ground!